Can you believe that we are in the last week of August already?? September is just a few short days away...what happened to summer?? Here in Southern Ontario, the kidlets will be heading back to school (YAY) right after Labour Day (YAY). This week the crew at SHOPPING OUR STASH want to know what your favourite season is. Are you sad to see the hot sunny days of summer come to an end? Are you waiting and wishing for snow?? Fall is my favourite season, the changing of the leaves, the weather getting cooler...I just love it! I dug deep into my stash for this one, going back to a card kit from October 2014!! Love your "fall" card, I like all seasons so I was torn which I wanted to do. originally Fall came to mind but we needed a little diversity with the team cards. I should have done Christmas it is my favourited card making season that I make all year. You packed so much fall on this that I think it must smell like pumpkin spice! Great assemblage! Ohh!! 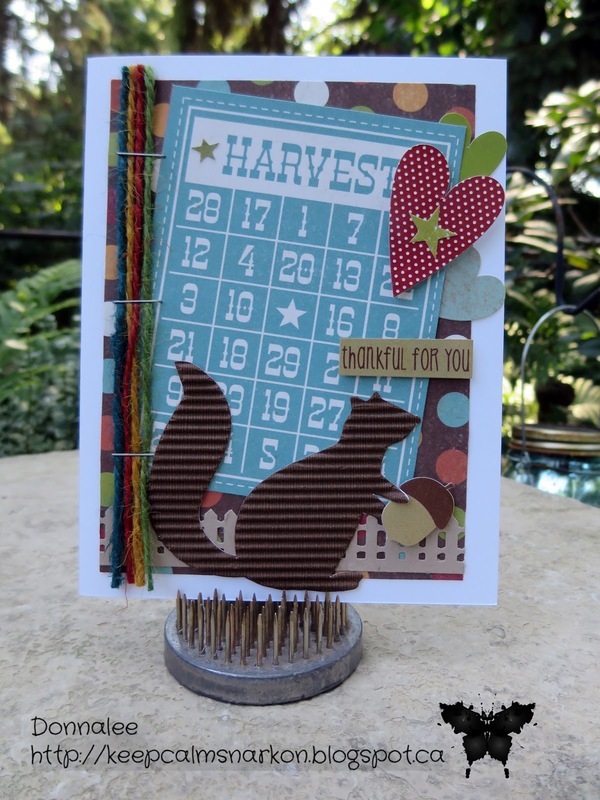 what an adorable little squirrel, a perfect addition to this fabulous Autumn card, love all the awesome details, like the stapled yarn and the awesome colors, the little fence is super cute.